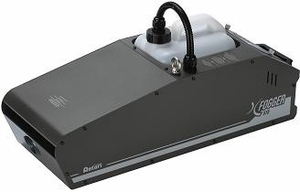 The X Series is our professional line of fog machines. We have worked with lighting engineers, stage managers and other entertainment professionals to create fog machines that meet all of their needs. These machines have a number of exceptional components and advanced features that separate them from all other fog machines available. These include aluminum cast heaters, customized Italian pumps for silent operation, low fluid indicators, interchangeable control modules, a high efficiency vaporizing system, circuitry that is protected from external power interference, as well as wireless, DMX and timer control options. These machines represent the culmination of over 15 years of fog machine design and manufacturing and have been very well received by the entertainment community. � Output: 20,000 Cu.Ft / Min. � Heat up Time: 11 Min.